Whether it’s to propose engineering changes for a prospective client, in response to a compliance effort, or in following best practices to archive network design at specific intervals, unquestionably, Visio is the preferred output for technical network documentation and network schematics. NetDepict diagramming software can support thousands of devices and can be run on virtually any Windows XP, Vista or Windows 7 PC with Microsoft Visio installed (drawing performance tied to hardware specifications). At the end of the day NetDepict allows you to shave all but final formatting and customizing from the effort to produce professional-grade network Visio drawings of any sized network in no time at all. No longer will you have to dread the unfortunate and time consuming task of producing drawings of the networks you manage. Install it on a laptop, use it when you need it and save your time for more important and higher-value tasks to manage your infrastructure. Whatever your needs, for a minimal investment, NetDepict network diagram software automates professional production of any view of any network for any reason! Get started now and eliminate all the work for the drawing task at hand! 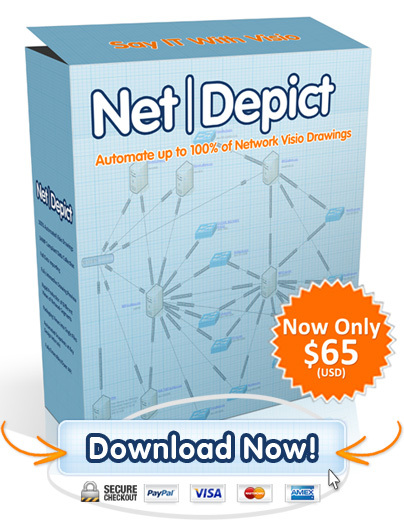 NetDepict is covered by a 100% money back guarantee that if in the first 60 days you are not completely satisfied with NetDepict and the quality Visio drawings it automatically produces we will refund your purchase price. We do networks too. Included in the price of NetDepict is an unlimited lifetime support that covers how to manipulate automated Visio output, how to import data into NetDepict for drawing and any other support issue you may need assistance with. Once you purchase your license of NetDepict you can be drawing high-quality, professional, compliance-grade Visio snapshots of any network you manage in no time at all. We find that at our price of $65 per unlimited license, NetDepict usually pays for itself in the first hour of use! Get that network drawing off your of list once and for all! 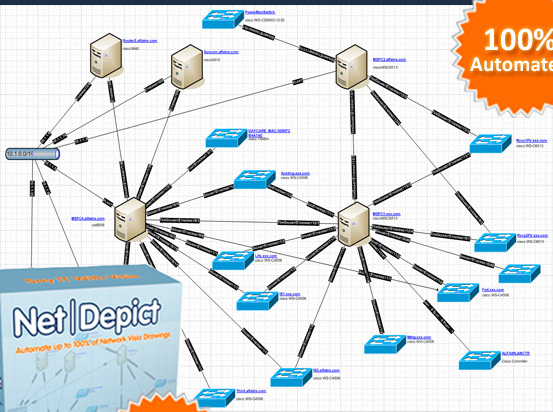 Save your time and expertise for more important matters, let NetDepict Say it with Visio for you! © Copyright 2010-2012 |NetDepict.net | All Rights Reserved.